Australians love renovating, and they love spending time outdoors. So it would make sense that they’d be good at outdoor renovations, right? According to Matt Leacy, Director and Landscape Designer at Landart Landscapes, a lot of renovators actually swallow up all their funds during the main build of the home, hoping they can just “wing it” when it comes time to do the garden. Unfortunately for most people, this doesn’t always work out. With that in mind, Leacy shares his top tips when approaching an outdoor reno. If you’re planning a home renovation, it’s advisable to consider landscaping from the beginning. Today’s home needs to relate to its outdoor space. That includes areas like your driveway and pedestrian entrance, which are both outside. “Outdoor space is considered with most good architecture, but can be enhanced with good landscaping design,” Leacy says. Leacy works closely with architects and says it can work to the architect’s advantage to have a landscaper involved from the beginning of a renovation project. The more you consider in the planning stage, the smoother your renovation will run. It will save you money too, Leacy says. “It’s a lot cheaper to draw and correct something than to build and correct something,” he says. A lot of landscaping in built underground – things like light fixtures, plumbing and irrigation. Leacy says he’s seen too many renovators blow all their budget on the main build of the house and leave nothing for landscaping, which can leave the finished product looking, well, unfinished. “Architecture can look good on its own but it looks even better with a garden that is designed to compliment and enhance it,” Leacy says. “It’s really evident when people have spent all their money on the build. It’s important to work with what you have, and design around it. A sloping backyard, for example, can be a huge asset. “If you’ve got a sloping yard, work with the levels and use them to your advantage,” Leacy says. 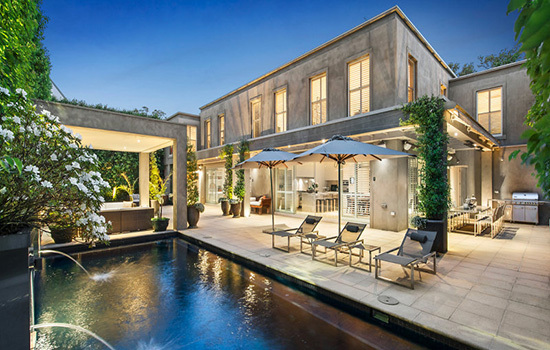 In a Terrey Hills property he designed recently, Leacy used the pool to level the backyard. If you’re going to put a lot of work into your garden, you want to be able to appreciate it at any time of the day. Outdoor lighting sets of the tones and depths of your garden, creating a mood at night. You may think breaking up the components of your backyard renovation will save your time, dollars and sanity – but Leacy says the opposite. “Don’t break up all the components and try to project manage it yourself. It will most likely cost you money if you’re not experienced,” he says. The backyard is not only important for livability – with most Australians using the backyard almost as much as their house – but also for saleability. “The pool is often used as the hero shot of a real estate ad,” Leacy says. In the summer months, the outdoor room is the entertaining hub of the home. Think of it as part of the house, says Leacy. In New South Wales, you need permission from council to build a retaining wall higher than 600mm from ground level. But Leacy says there is a lot of landscaping work you can do under complying development, which means going through a private certifier as opposed to going through the council. Under complying development your options include pools, decks, pavilions.If you fail to take a development application under council or through a private certifier, you could be forced to remove the work and/or be hit with a fine. We found this great article on www.realestate.com.au and had to share!